So it rained in Tokyo last Saturday which gave me a chance to fit a new set of Tioga Factory FS100 tyres to my Giant STP. Of course when the job was done I couldn't resist the opportunity to try them out in the wet conditions. While out and about I stopped by the Omiya Hachimangu Shrine in Suginami-ku where I had hoped to photograph some of the beautiful autumn colors, but given the nature of weather that was not to be. 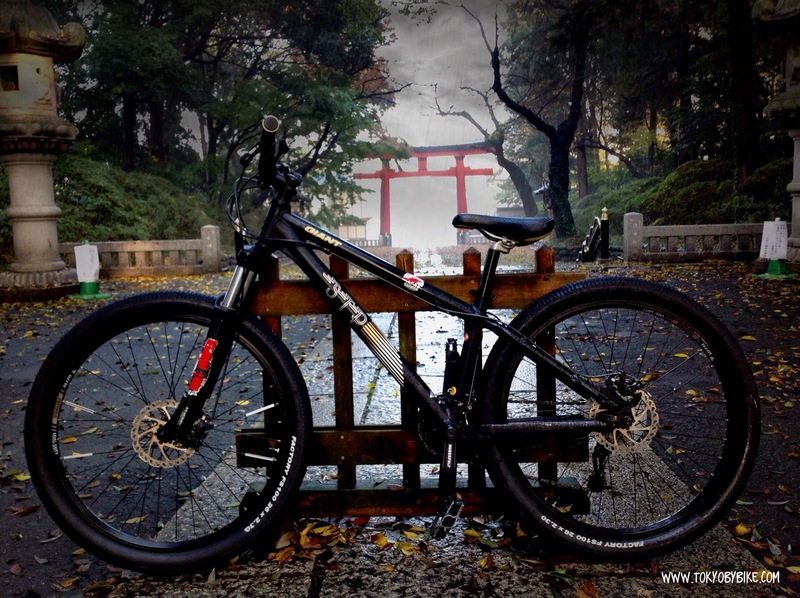 Instead I got a couple of great shots of my bike in the temple grounds. The Giant STP is my play bike. In my younger years I spent a lot of time mountain biking in the mountains surrounding Tokyo, but now I have a family I can't justify spending all that time on myself. Luckily we live near a river that has parklands on each side, areas of which have been left rather wild that provide fun off road challenges so I can get out for short quick rides that don't take up the whole day. In addition to this the urban landscape of Tokyo offers some pretty interesting challenges itself, especially the business districts if you tackle them at night when there is nobody around apart from skateboarders. This makes the Giant STP a great choice of bicycle for the city bound rider who still yearns for the hills.